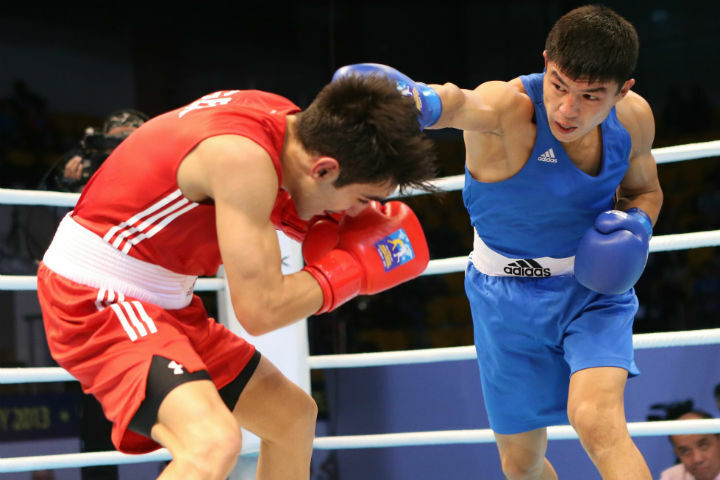 Kazakhstan Lightweight (60kg) Berik Abdrakhmanov overcame a major hurdle today when he beat the talented German Robert Harutyunyan at the AIBA World Boxing Championships Almaty 2013. In addition to the Lightweights, we also had the Light Heavyweights (81kg) and Super Heavyweights (91+kg) in the ring. As usual there was plenty of action on this final day of preliminaries. Lightweight Robert Harutyunyan took on sixth seed Berik Abdrakhmanov of Kazakhstan. The German punching machine was less overawed by the crowd than many others who have gone out to face boxers from the host nation so far, and this is probably thanks to his WSB experience with the German Eagles. The Kazakh however isn't just relying on intimidation from the audience to win his bouts; on the contrary he is a highly competent boxer. In round one, Abdrakhmanov had tried various methods to deal with the rampaging German and finally, by the end of round two, he had opted to stand his ground and trade with Harutyunyan. In a tight bout, the Kazakh did enough to see off his rival and take the win. "I didn't box as well as normal today", said the German. "Not winning is hard of course, but next time I will be better. For now, the result is just motivation. On the positive side, this has been good for me overall. It was my first World Championships, so I've got some valuable experience in the ring and I made it through the first two preliminary bouts. So I'm not too disappointed". Heavy hitting Russian Nikita Ivanov had a hard battle against Simone Fiori of Italy at Light Heavyweight. This was a tough bout for the Russian with the Italian displaying some fine skills. At one point it almost looked as though Fiori was going to steal it, but the APB boxer just managed to hang on to make it through to the quarter-finals on a split decision. Domenico Valentino of the Dolce & Gabbana Italia Thunder took on Lindolfo Delgado of the Mexico Guerreros in the opening bout of the day, an all WSB match-up. The two seasoned Lightweight boxers sized each other up for most of the first round, probing each other's defences for potential openings. The Italian was able to pick out a few solid jabs down the centre line, whilst the Mexican replied with overhand rights and long hooks. At the opening of the second, the Italian tried to use this mechanism to expose the Mexican. Feinting with the jab, he hoped the Guerrero would let his hook fly into a void and open up a nice target. But Delgado wasn't fooled by the ruse. And so the bout progressed; a chess match with each of the boxers attempting to find a gap or angle to work on. In the end however, it was the shrewd Italian Valentino who advanced (3:0) after an interesting bout. Elsewhere, APB and WSB German star Erik Pfeifer took on Mihai Nistor of Romania, who fought for the Astana Arlans Kazakhstan team in Season III. This was a clash of monster proportions, both figuratively and literally. The two Super Heavyweight boxers are both renowned for letting their hands fly when needed. Nistor rose to prominence in the public imagination following his outstanding bout against Oleksandr Usyk in the Season III WSB Finals. He showed much of the same tenacity in this bout, hunting for his openings and landing heavy shots. Pfeifer, the German Eagles star boxer last season was equally dangerous. Initially, Pfeifer seemed unsure how to pick the defensive lock of the southpaw, but perhaps he had the better work rate. At the end of the gruelling match, the pair embraced like old friends and showed a lot of mutual respect. Pfeifer took it 3:0 but the judges all scored it 29/28, which shows just how close it really was. "That was really tough and my opponent fought very hard, so I'm happy to have gone through", said the German. Alaa Ghoussoun of Syria takes this category again as he took on Abdelhafid Benchabla of Algeria. The southpaw Syrian landed some outstanding blows early in the second, backing his opponent into a corner and offloading heavily, but his aggressive approach resulted in a warning in round two, and then at the end of the round he was caught by a right hand that wobbled him on the bell. The Algerian managed the bout intelligently thereafter coming on strong at the end of the third to ease past the Road to Almaty boxer, who has nonetheless had an excellent tournament. Lazaro Estrada of Cuba looked outstanding against Fazliddin Gaibnazarov of Uzbekistan at Lightweight. The two southpaws were both excellent and involved with a game of cat and mouse in which the rolls were frequently reversed. Nonetheless, Estrada came out of a technical bout with a decent win. He is flying under the radar so far but that may change now that he is in the quarter-finals. "He's a tough guy. He always comes forward and works up close and really grinds.Fighting him is quite uncomfortable" - Pfeifer (Germany) perhaps somewhat understatedly describes his opponent Nistor.